Portland moves 27 games over .500 as Henry Owns wins his seventh straight start, 5-4 over Trenton. TRENTON, N.J.— The Portland Sea Dogs continued their winning ways Tuesday night, holding on for a 5-4 win over the Trenton Thunder to move 27 games over .500. Henry Owens bounced back from allowing four runs last Thursday, by giving up two runs on seven hits to the Thunder. He won his seventh straight start to improve to 11-3 with a 2.30 ERA in 15 starts. With prospects like Owens, catcher Blake Swihart, shortstop Deven Marrero and a lineup that entered Tuesday batting an EL-best .286, it’s no surprise that the Sea Dogs are having success. However, another pivotal reason for Portland’s success is an unheralded catcher who has played in just 29 games. Matt Spring, a soon-to-be 30-year-old lifelong minor leaguer, is a leader in the Portland clubhouse, keeping what can be a volatile mix in a minor-league team together. 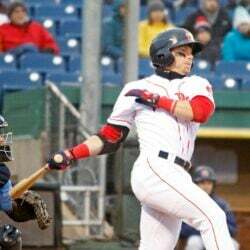 “He’s a very good addition to this team,” Sea Dogs Manager Billy McMillon said. Spring is happy to pass on the lessons he learned from veterans shortly after beginning his career with Tampa Bay, which drafted him in the fourth round in 2004. In his 11th professional season, Spring is having one of his best campaigns. A career .215 hitter with a .283 on-base percentage and .394 slugging percentage, his .245/.316/.500 in 98 at-bats this year is certainly respectable for a catcher known for defense and leadership. His two homers in Sunday’s win at Reading and double in Monday’s loss to Trenton show he still has power. Finding a rhythm while playing sparingly can be difficult, but Spring won’t complain. And don’t think for a second that Spring believes he is in Portland merely in a leadership role; he firmly believes he has the ability to play in the major leagues and hasn’t given up hope. The closest he has gotten is five games in Triple-A, most recently in 2012 at Pawtucket. “If I didn’t think I could still play in the big leagues and didn’t have that opportunity, I probably wouldn’t be playing anymore,” he said. “I understand it’s going to take a few fluky things for me to get up there, but I know I can play in the big leagues. It hasn’t worked out yet; that’s not to say it won’t. I have to keep getting myself better while helping these guys develop into better professionals. Note: With rain in Thursday’s forecast in Trenton, the Yankees moved up the rehab start of left-hander CC Sabathia to Wednesday night.